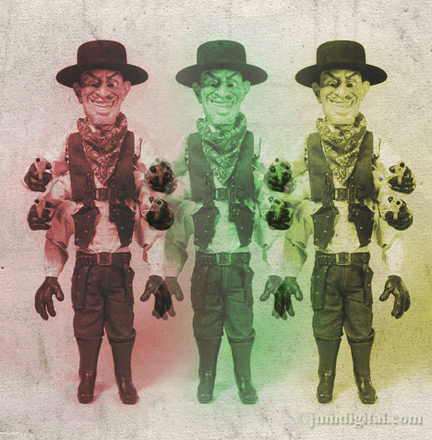 Six shooter is a six armed cowboy puppet with guns in each hand. He wears a handkerchief that jumps up to cover his mouth whenever he shoots someone. It is never explained how this is possible, but one may just assume it is part of the magic that animates him in the first place. He did not appear until the second film, but he was just being repaired and played no part. He appeared fully constructed in "Toulan's Revenge". Six Shooter, like several of the other puppets, is presumably inhabited by the soul of a human being. It's identity is never revealed, however, his retro version in Retro Puppet Master contains the soul Afzel. Puppet Master is a horror film franchise which focuses on a group of puppets animated by an Egyptian spell, each equipped with their own unique and dangerous device (although not in all installments of the series are the puppets portrayed as threatening) and are represented as heroes, anti-heroes, and antagonists. Produced by Full Moon Features, the series was established in 1989 with the eponymous first installment, which has since been followed by seven sequels (in addition to a crossover with the characters of Demonic Toys), a comic book spin-off and numerous other collector's items. In 2010, its latest sequel, Puppet Master: Axis of Evil was released on DVD and Blu-ray. I love a demented and slightly off Xmas. You are awesome! I didn't know about the 2009 release. Good lord, I must get it immediately. Wow, I didn't realize they'd made so many! I haven't heard of the Puppet Master, but your artwork is awesome, as always!! Dare You, Double Dog Dare You! It's Hot on This Holiday! Court Today... Guilty Or Not Guilty? How Does She Keep Getting Away With It? On the Tenth Day of Creepmas: Ladies Night!